Iroquois or Haudenosaunee were the tribes forming the Five Nations Confederacy & by 1750 the Six Nations. For the most part they encompassed the upper NY. state region. Its difficult to delineate specific spike tomahawk shapes that exclusive to the Iroquois since there seems to be such a wide variety at use & so many tribes & makers at work. 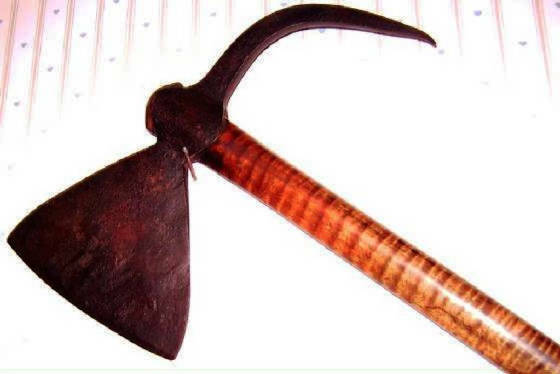 Perhaps 75% of all the spike tomahawks I have seen that had provenance were from the state of New York (Iroquois country) & indicates their high preference for them & great availability during the 18th C. One type the Iroquois were known to use had blades that flare in both directions, double ears and curved spikes that have been found on Iroquois sites. Some have referred to these as simply early Eastern style spike tomahawks, however they seem to be centered around the state of New York/Pennsylvania & adjacent Ontario among the surrounding Neutral, Mahican, Lenape & Huron tribes. They are mostly from the 18th C. or earlier & in the Great Lakes region centered in the finger lakes of upstate NY. Generally the more curved the spike is the earlier the time period was when it was made. As time went on they seemed to prefer them straighter & shortened spikes although no actual study has ever been done on this & details are scarce. Some of the earliest of these spikes curved so much they actually curved back towards the blade slightly --to the point it seems unusable however an explanation for that or how exactly it was used still eludes us. One other interesting note about this category is that the double flared blade often claimed to be of 'Spanish' origin elsewhere has no connection here whatsoever. This particular one below is unusual in that it has a square nail pulling notch. Sometimes early farmers would plow these up and continue to use them so perhaps that is the case but we will probably never know for sure. The pointed spike has been blunted. 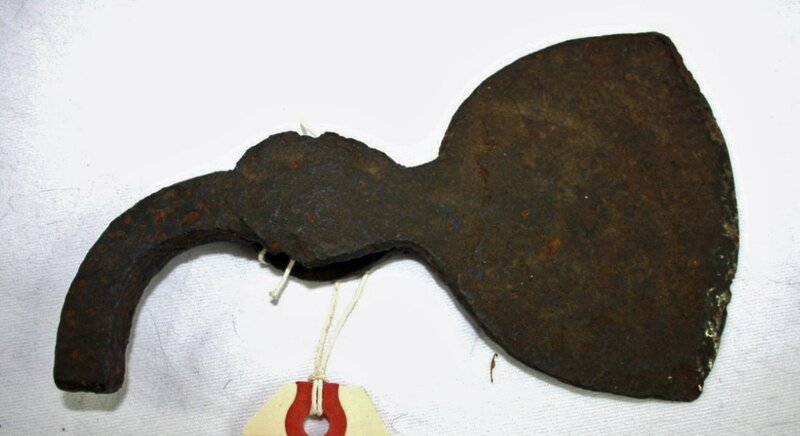 Mid to late 18th C. it measures 7.625" x 3" & weighs 14.4 oz. This chisel-like end spike tomahawk was found in upstate NY. 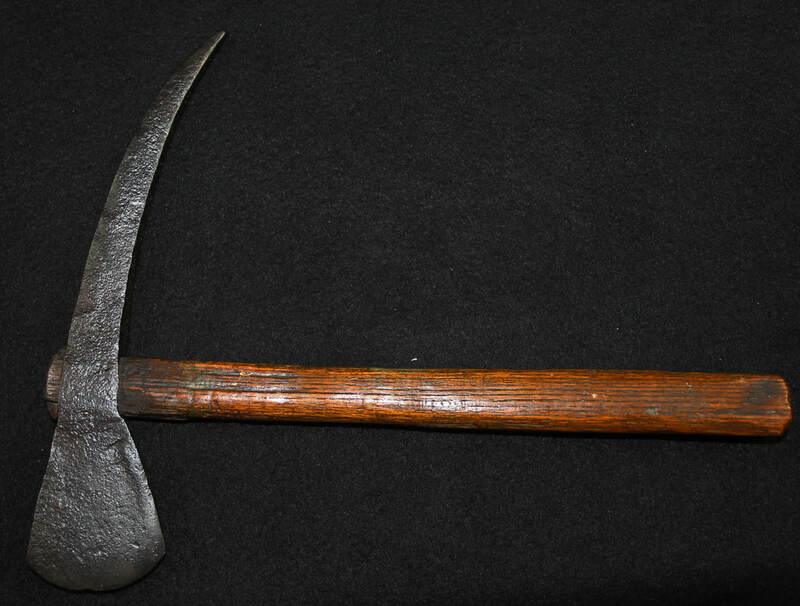 The chisel-like end was used as a stabbing weapon, not as a tool. I'm noticing that people are confusing adze/axe combination tools for these, possibly from my website. Adze/axe tools are something that comes in many variations but never with chisel tips as this one. These combination tools go back to Roman times when they were called dolabras-- not tomahawks. Some axe/adze combination tools were as small as ~1" wide adze blades to rough out mortises on logs & planks which are still made today. Technically they are not used as adzes, but rather as axes of different sizes used at perpendicular angles to each other for different purposes. Anything over ~3/8" wide is far more likely a tool & not a tomahawk. These type combination tools are still made today. This type was commonly found only among the Iroquois in the Eastern great lakes region which are sometimes colorfully referred to as 'belly rippers'. They were only in favor during the 18th C. & many of the Iroquois had been decimated by the end of the 18th C. due to their participation in the Revolutionary War helping the British --survivors being either forced Westward or onto reservations. This one measures 9.5" long x 5.25" wide blade. The handle is of course a modern replacement. This Iroquois tomahawk has the typical early spike except it is finished squarish instead, 3/8" x 0.5". This is the only one I've seen with this kind of blunt poll instead of a point. It appears to be original to the piece & not broken. A mere 9.7 oz. 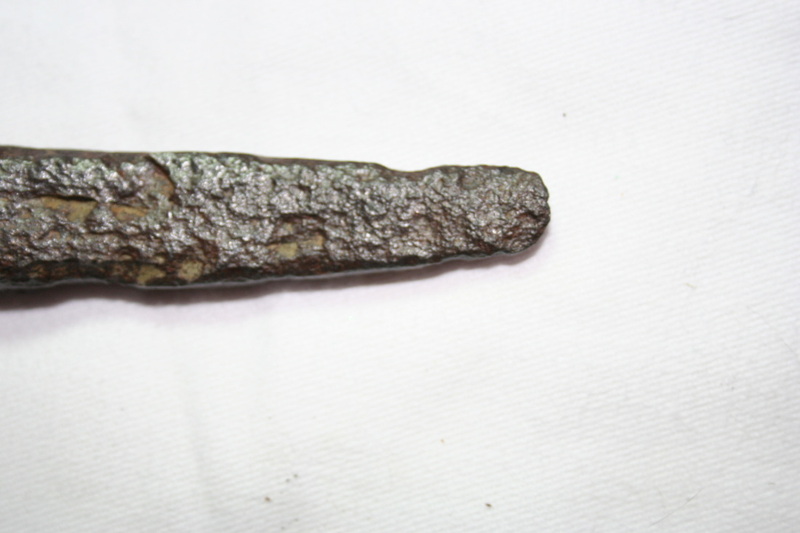 Here is another 18th C. or earlier Iroquois spike tomahawk It was obviously a surface find based on the pitting pattern yet changed hands with no information on it's location-- PLEASE DOCUMENT YOUR FINDS! 7.25” X 2.41”; Wt: 5.5 oz. Was the spike tip bent in throwing or was it designed that way? We really can only provide conjecture but there are others just like it & it seems to me from the miss thrown accounts I've read this is the more likely reason. From a practical standpoint it would seem odd if there were not some spikes bent from missed throws. Here is another 18th C. or earlier Iroquois spike tomahawk which has the typical elongated curved spike of the chisel type tip, splayed blade shape of that era. It was obviously excavated but changed hands with no information on it's dug location-- PLEASE DOCUMENT YOUR FINDS! It measures 8.5" wide x 3.375" high and weighs 14.3 ounces. A steeled edge less than .25" wide is easily discernible on the blade. This spike tomahawk was metal detected in Spencertown, NY. 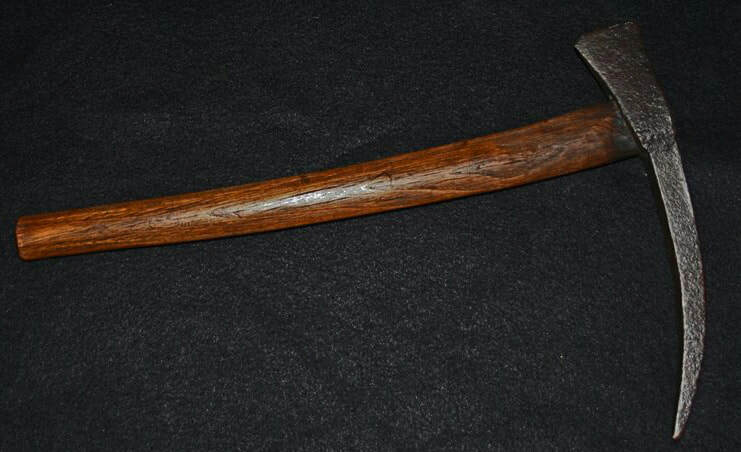 and is similar to the attributed Mohawk example in Peterson's book #75 except the angle of the haft is straight instead of canted up at the blade. The Mohawks were the largest tribe among the Iroquois Six Nations & were always allied with the British mainly thanks to Sir William Johnson who was particularly adept at compelling oratory & was adopted by the tribe. 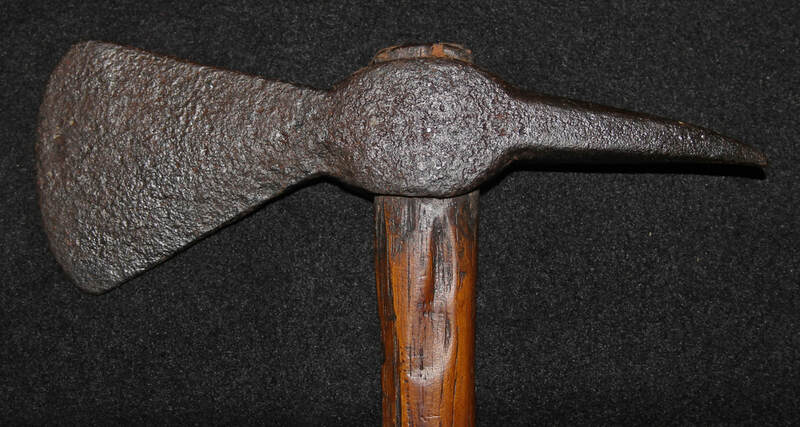 Iroquois spike tomahawk head reportedly from Onondaga, NY area with modern repro maple haft. 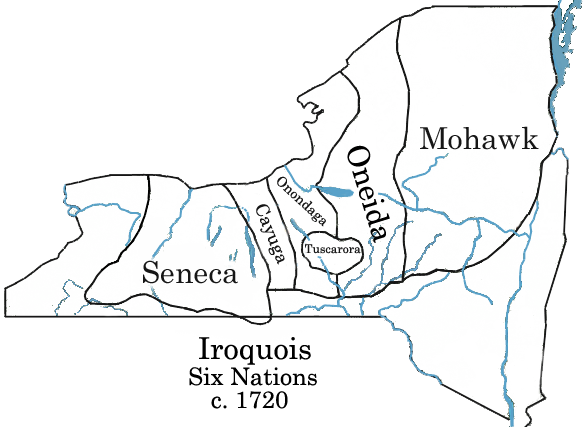 The Onondaga village was the capital, so to speak, of the Iroquois League of Nations. 7 1/4" long. This long spiked version with the short blade seems to be an early style. Some of them are very similar yet have perfectly straight spikes. This one has a maple haft that was split with the grain for strength from the period of usage & oval shaped in cross section. Another 8.5" head with a period 10.5" ash haft.